I guess we shouldn’t really call it an “exposé” because it doesn’t tell us anything we didn’t expect. Still, it can be eye-opening to see the sorts of things voucher programs can do. 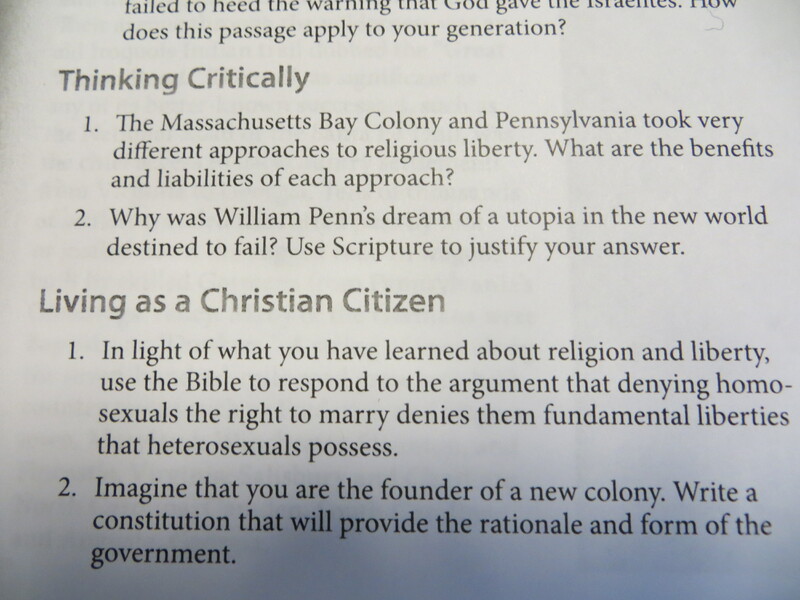 This week, the Orlando Sentinel explores the content of fundamentalist textbooks used at area private schools. The story prompts us to ask a tough question about voucher programs: Is it fair to limit voucher programs only to religions we like? Should taxes pay for these textbooks? As I’ve argued in a couple of academic articles, the history of fundamentalist textbook publishing is key to understanding both the “Christian-school” movement and the subsequent evangelical homeschooling exodus. Without the work of school publishers such as A Beka Book, Accelerated Christian Education, and Bob Jones University Press, I believe, conservative evangelicals in the 1970s and 1980s would not have been able to open so many small private schools. And without pre-made curricular materials, evangelicals would not have been able to leave school by their millions in the 1990s to homeschool. Plus, no one should think that these fundamentalist textbooks are static or monolithic. As I explored in a chapter in AJ Angulo’s terrific book Miseducation, ACE, A Beka, and Bob Jones are all very different from one another, and all have radically changed their treatment of topics such as US History. It’s not just me: Dr. Jonny Scaramanga has devoted his early academic career to exploring the curriculum to which he was subjected as a youth. Dr. Scaramanga argues that Accelerated Christian Education never escaped its racist, homophobic origins, despite some surface changes and lip service to liberalization. [Investigators] found numerous instances of distorted history and science lessons that are outside mainstream academics. The books denounce evolution as untrue, for example, and one shows a cartoon of men and dinosaurs together, telling students the Biblical Noah likely brought baby dinosaurs onto his ark. The science books, they added, seem to discourage students from doing experiments or even asking questions. . . .
We have to ask: Is this sort of thing okay for a tax-funded school? After all, there is nothing in this story that should come as a surprise. If we want to allow voucher programs that send tax money to private schools, we should expect some of those dollars to pay for curricula we disagree with. Is that okay? Hard-hitting curriculum for Florida’s third-graders. This sample comes from an Accelerated Christian Education reader. Or, to put it in nerdier terms: How should policy-makers decide if religious schools qualify to participate in tax-funded programs? It can’t be simply on the basis of our own personal religious views. For example, I believe the ACE, BJU, and Abeka textbooks are terrible and I would never want my kid to use them in school. But my personal preferences can’t suffice to dictate policy. How can we decide which religious schools qualify for tax-funded voucher programs? One option would simply be to make ALL religious schools off-limits for voucher-funded students. In some cases, though, that would seem to keep deserving kids from getting a higher-quality education than their local public schools can provide. But WOULD they? Anyone who knows the real story of American higher education knows that creationist students have plenty of creationist colleges they can attend. Is it fair to say that students can’t study creationist books because they don’t agree with mainstream science? Isn’t that the whole point of private schools in the first place? Please don’t get me wrong: I’m firmly against using tax dollars to fund private religious schools. I think we should nix ALL religious schools from that sort of public funding. But we can’t do it only for some religious schools and not for others, based on the fact that we don’t like some of the religions. And we should not be surprised to find out that voucher programs are doing precisely what they were designed to do: Fund religious schools. What Goes on in Fundamentalist Schools? When does bad school cross the line into child abuse? The depressing answer is that it depends on who’s asking. Jonathan Kozol famously decried the racist and abusive practices in America’s urban public schools. Now Rebecca Klein is warning that tax-funded evangelical schools are doing more than just bad teaching. Are these schools using your tax dollars to abuse children? Klein’s article focuses on the stories of fundamentalist school survivors such as Ashley Bishop. Bishop tells a story that has become depressingly familiar to SAGLRROILYBYGTH. Like some of the voices on this blog, Bishop’s experience in conservative evangelical schools was beyond terrible. Her schooling left her deeply conflicted and depressed. It took her years to become comfortable with herself and with her sexual identity. My heart breaks for Ashley and all the other young people traumatized by hostile school environments. We tend to hear about brave survivors like Ashley, but we must remember that there must also be many more students who never escape, who make their lives entirely within a community in which they feel isolated and unworthy. The more attention such students can receive from journalists like Klein, the better. there are thousands of kids receiving an extremist and ultraconservative education at the expense of taxpayers. For full disclosure, I should point out that I spoke with Klein as she put this article together and she refers to my research. I must also point out that there are a few important points that she leaves out. This is terrible stuff. But is it abusive? First of all, education scholars and historians know that we can’t simply equate textbooks with school curriculum. We certainly can’t look only at textbooks and think we know what kind of learning goes on. Second, though Klein states that A Beka, Bob Jones, and ACE all share “largely similar educational philosophies,” that’s simply not the case. As I discovered a few years back, there are actually vast differences between the A Beka, ACE, and BJU approaches. A Beka insists on a rigid, traditionalist, teacher-driven classroom. BJU wants the opposite. It’s also important to note that these textbooks are not static. In a recent book about education and ignorance, I argued that the treatment of history in A Beka and BJU textbooks has changed dramatically in the past thirty years. In some ways, the textbooks have become more like mainstream offerings. In others, they have become very different. In general, both BJU and A Beka have increased their emphases on the distinctive religious elements of their historical vision. A Beka history books, for example, explain in more recent editions that Native American populations originated from the downfall of the Tower of Babel. Finally, and most important, we need to remember that abusive schools are not bad only if they use tax dollars. The state has a responsibility to protect all children in any school or homeschool. Even if a school is entirely privately funded, it has no right to enact policies that aren’t in children’s best interests. In some cases—such as physical abuse or neglect, or sexual predation—that line is fairly easy to discern. When it comes to religious ideas, though, it becomes enormously difficult. Is it abusive to teach children that homosexuality is a sin? Is it abusive to teach children that mainstream science is a cauldron of lies? If it is, then the state has the right and duty to intervene. It doesn’t matter whether or not the schools receive tax dollars in the form of vouchers. If it isn’t, though, then religious families and schools must be allowed freedom to have schools that we wouldn’t want our children to attend. Bad news: You just failed English. What can you do? In several school districts, you can take an approved online class to make up the credit. Recently, Slate reporters examined these online classes to see if they were any good. Mostly, they weren’t. Lurking at the very bottom of the barrel were sad-sack online tutorials provided for homeschoolers by the fundamentalists at Pensacola Christian College. Has PCC’s rigid traditional philosophy has caught up to it? Or are they providing precisely what fundamentalists want? Thanks to the ever-watchful curmudgucrat Peter Greene, we stumbled across an intriguing update to our study of fundamentalist curriculum. Slate worked with the Columbia School of Journalism’s Teacher Project to produce an eight-part expose of “online credit-recovery” programs. At most schools, students who fail a class can take one of these online modules in order to graduate. Like old-fashioned correspondence courses, these new programs hover in the depressing gray area between unfortunate necessity and outright scam. In some cases, students taking these courses don’t learn a thing, but their “success” can be used by school districts to inflate their graduation statistics. The online catch-up courses sometimes fill a real need and serve students who don’t have a better option. In some cases, though, they are pure educational garbage. Francesca Berardi and Zoë Kirsch picked three programs that they called the “bottom of the class.” Your humble editor noticed an old fundamentalist friend on the shortlist: A Beka Academy. SAGLRROILYBYGTH may recall our earlier work with A Beka. The publishing company has its roots at Pensacola Christian College. Back in the 1970s, Arlin and Beka Horton (A + Beka…get it?) complained that their alma mater Bob Jones University had gone soft. They warned Bob Jones III that leaders of BJU’s ed school such as Walter Fremont and Phil Smith had imported dangerous secular ideas into their teacher-training program. Above all, Christian schools must be steered completely clear of the philosophy that has progressively wrecked the public schools. Permissive discipline, for example, is wrapped up with teaching methods that always try to make learning into a game, a mere extension of play, the characteristic activity of the child. Progressive educators overlooked the fact that always making learning fun is not the same as making learning interesting. . . Memorizing and drilling phonetic rules or multiplication tables are ‘no fun’ (though the skillful teacher can make them interesting). They can have no place in a curriculum if the emotion of laughter must always be attached to each learning experience a la Sesame Street. Will everybody get to go to heaven? No. Who gets to go to heaven? The people who trust in Jesus and who take Him as their Savior while they live here on earth. Does God want everybody to go to heaven? Yes. Why won’t everybody get to go to heaven? Because some people won’t take Jesus as their own Savior. In the A Beka world—a world that is populated by plenty of homeschoolers and evangelical-school students—the perfect learning environment consists of a loving authoritarian teacher delivering theologically pure information efficiently to obedient students. One rambling four-minute excerpt from an 11th-grade English course, for instance, consists mostly of corny lectures from a teacher on the work of 17th-century poet Anne Bradstreet. “[She] calls her poetry a child,” the teacher says. “And just as a child can be unruly, just as a child may not quite always look just right … this morning as we’re eating breakfast, I look at the girls, and they’ve got Nutella all over their face,” she continues. Poetry, like children, can be “a little messy.” The instructor wraps up by questioning the students about the religious message of Bradstreet’s poetry. The students then take turns rising, accepting a microphone, and slowly reading their handwritten responses in flat tones—not exactly engaging pedagogy that’s likely to hold the interest of struggling learners. In another sample, a 12th-grade class called “Document Processing,” students can learn typing while watching four videotaped teenagers, well, type. The teacher circulates between the teens on the video, reminding them to “add that space there” and providing other tips. By the time she asks the students to check their posture, the viewer himself may be so bored he’s slouching out of his chair. Sounds pretty grim. To be fair, A Beka’s lame online courses are not the only terrible ones on the market. The Slate series poked several other holes in the shadowy world of online credit-recovery coursework. But here are our questions for this morning: Is the pedagogical lameness part of the appeal? That is, do fundamentalist schools and homeschools think that such tame fare is part of A Beka’s continuing effort to instill Biblical discipline in classes? To root out secular giggles, “a la Sesame Street”? Or has A Beka just gotten lazy? Do the Pensacola publishers simply recognize that they have a captured market of fundamentalists, people who wouldn’t trust secular courses? Have the A Beka folks just relaxed too much, knowing that fundamentalist teachers and parents have no other options? It is a dilemma at the heart of Christian faith: To know or to obey? 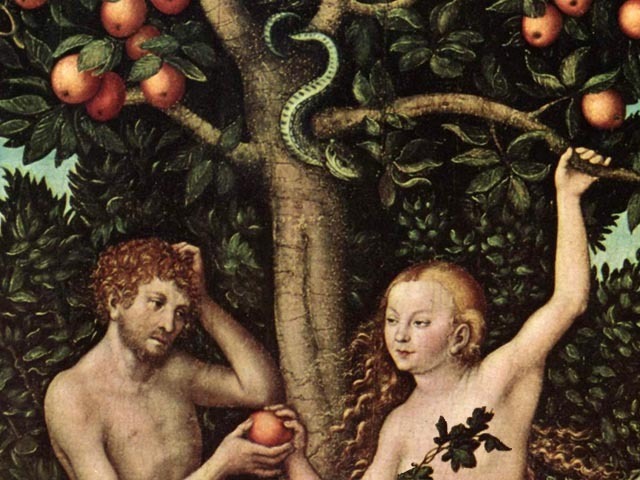 The original sin of Adam & Eve, after all, was to become as gods by eating from the Tree of Knowledge of Good and Evil. This week, a state supreme court judge in Oregon faced the unenviable task of ruling whether faithful people knew by faith or by fact. Not surprisingly, she punted. Especially in schools and universities, questions of knowledge and faith will continue to bedevil us all. I’m arguing in upcoming books that religious people deserve considerable wiggle room when it comes to requiring knowledge about evolution or US history, but it’s not impossible for policy-makers to be bolder than they have been. What did you know? And when did you know it? In the Oregon case, two parents from a strict religious sect were convicted in 2011 in the death of their infant son David. The boy had been born prematurely. The parents did not call for medical help but rather treated David at home. After nine hours, David died. Were the parents criminally liable for their faith-based failure to get medical help? Oregon Supreme Court Justice Virginia Linder recently said yes. Sort of. For our purposes, the most intriguing elements of this case are the tangled web of meanings in this case surrounding faith and knowledge. If the parents “knowingly” allowed their baby to suffer from treatable ailments, according to Oregon law, then they are criminally liable. But they hoped to force the state to prove that they “knew” it. They hoped to force the government to prove that they must know something that they refused to know. Justice Linder did not decide the big question. Instead, she noted that the parents defended their actions with a different set of knowledge claims. The parents said they did not know the baby was sick. They said he appeared healthy until the very last minute. Doctors disagreed. They said any reasonable person could have discerned that the baby was in severe medical crisis. At trial, defendants argued that, because they withheld medical treatment from David based on their religious beliefs, the Oregon Constitution requires the state to prove that they acted “knowingly”—that is, they knew that David would die if they relied on prayer alone and, despite that knowledge, failed to seek medical treatment for him. Justice Linder affirmed earlier court decisions that the parents were guilty of criminal neglect for their actions. The state, she ruled, did not have to prove that they “knew” of the harm they caused. But she did not decide if the parents must have known something they refused to know. The complexity of the case shows yet again the durability of questions of knowledge and faith. Can the government insist that parents provide medical care for their children? In Oregon, yes. But can the government insist that parents “knew” their child needed medical care? That is a far more difficult question, and one that this ruling painstakingly sidesteps. As SAGLRROILYBYGTH are well aware, nowhere do these questions of faith and knowledge clash more regularly and predictably than in the area of education. Can the government require that students “know” evolution? …that kids “know” how to prevent sexual transmitted infections? …that kids “know” how the first humans came to North America? Also, how have private schools and universities attempted to shield young people from these sorts of knowledge? Alas, secular progressive types like me cannot relax and claim that public schools should always promote knowledge over ignorance. After all, I agree that certain types of knowledge are not appropriate for certain groups of students. For example, we should teach all children about horrifying historical episodes, such as lynching in the USA or the Holocaust. But we should not expose young children to gruesome images of charred corpses, sexually mutilated before being lynched. At least, I don’t think we should. Such images are true. People should know about them. But I do not think seven-year-old children should be exposed to that sort of knowledge. I agree that schools should work to keep young children ignorant about such knowledge, even though I acknowledge that it is true and important. The difference, in other words, is not that conservative religious people want to keep knowledge from children, while progressive secular folks want to give knowledge to children. The difference is only in what sorts of knowledge we want to shield students from, and how. As I argue in a chapter in an upcoming book about ignorance and education, we can see these questions starkly exposed in the history of curriculum for private conservative evangelical schools. 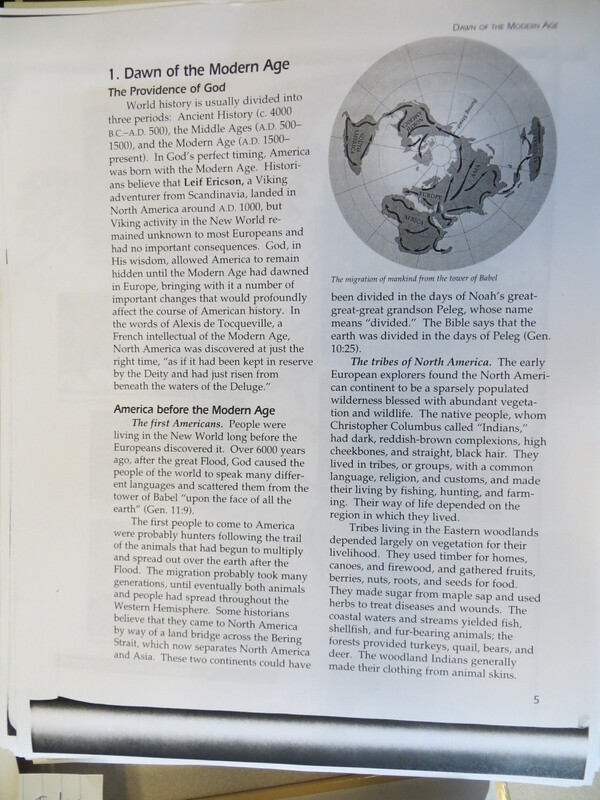 I looked at US History textbooks produced by Bob Jones University Press and A Beka Book. In each case, from the 1980s to the end of the twentieth century, publishers made claims about historical knowledge in each succeeding edition that were farther and farther afield from mainstream historical thinking. 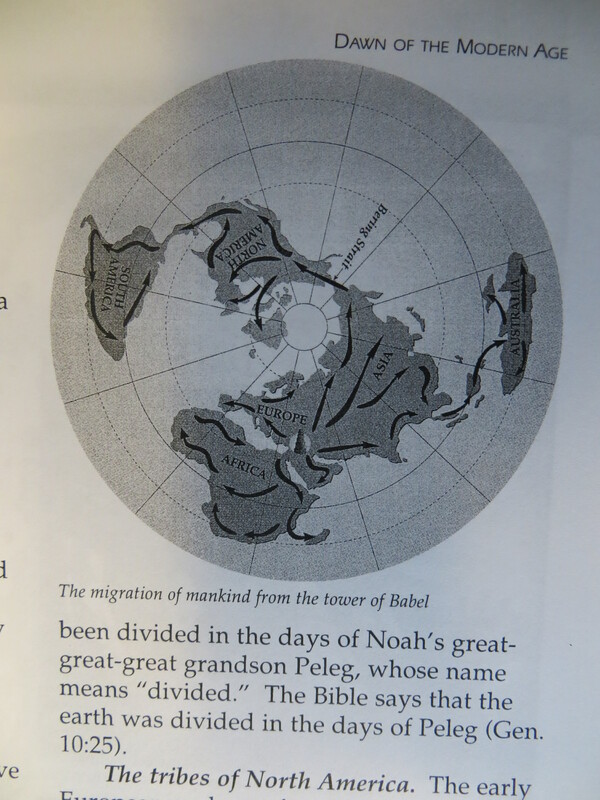 In a later edition, for example, a history textbook from A Beka explained that humanity expanded around the globe after the fall of the Tower of Babel. Obviously, that is a very different explanation from what kids would read in a mainstream textbook. Publishers like A Beka hoped to shield students from mainstream knowledge about history by replacing it with an alternate body of knowledge. These textbooks do not simply try to create ignorance by blocking knowledge, but rather try to foster ignorance about a certain sort of knowledge by producing a convincing set of alternate knowledge. When it comes to evolution, too, questions of knowledge and belief quickly become tangled and tricky. I’m arguing in an upcoming book with co-author Harvey Siegel that students in public schools must be required to “know” evolution. But too many public-school enthusiasts, we argue, have a cavalier attitude about this sort of knowledge. Yes, students must “know” and “understand” the claims of evolutionary theory. But if they choose not to believe them, that is their business. Perhaps an easier way to make the distinction is to say that public-school students can be required to “know about” evolution. They must be able to explain it correctly. They must be able to describe accurately its main points. But if they think it would harm their religious beliefs to say they “know” that humans evolved via natural selection, then they have the right to insist that they only “know about” it. It’s not an easy distinction. Nor was it easy for Justice Linder to decide what to say about the Oregon case. Do parents have the right to their religious beliefs? Yes. Can they not know something that everyone else knows? Yes, certainly. Do they have the right to insist on that relative ignorance if it causes palpable harm to others? Not in Oregon. But this ruling does not decide if the parents in this case “knew” that their faith would save Baby David. It only states that parents do not have the right to insist that the government prove that they knew it. Posted in Evolution/Creation, In the News, What is school? Peddling Ignorance? Or Pushing Knowledge? Okay, so here’s the question: If a teacher or textbook tries to block children from getting knowledge, is that still education? Or is it instead the deliberate promotion of ignorance? 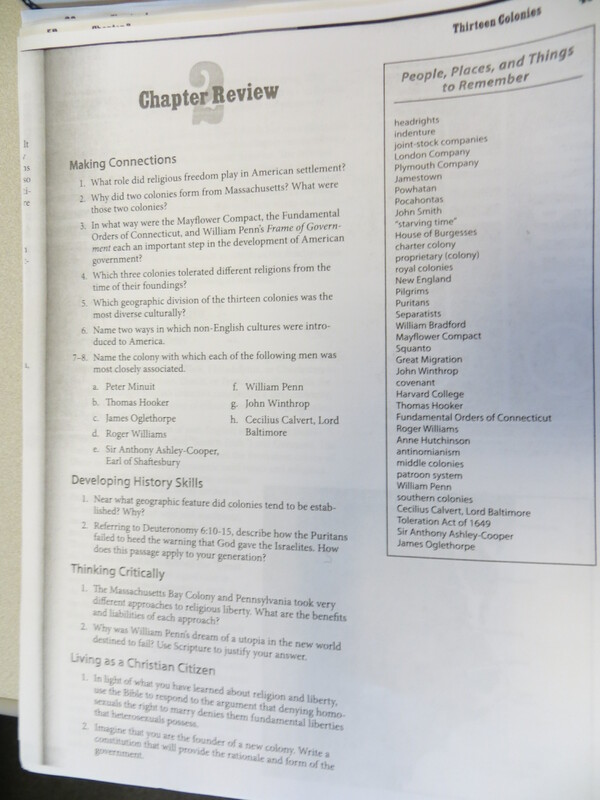 In the case of US History, conservative textbooks deliberately set out to block children’s understanding of the kinds of historical ideas kids might hear in public school. Does that count as education? How about if the textbook and teacher sincerely believe the truth of what they’re teaching instead? Here’s why I’m asking: I’ve spent the last couple of days debating these questions with a group of high-power historians and sociologists at the annual meeting of the Social Science Historical Association in scenic Toronto. Just next to the Hockey Hall of Fame. Our panel was convened by Winthrop University historian AJ Angulo. It was chaired by Kim Tolley of Notre Dame de Namur University, and joined by Dan Perlstein of Berkeley and Karen Graves of Denison. Andrew Abbott of the University of Chicago offered comments. Professor Anjulo is editing a book about the historical construction of ignorance in American education. The rest of the group has contributed chapters. My chapter, and the subject of my presentation in sunny Toronto, concerned history textbooks cranked out by Bob Jones University Press and A Beka Book. Both publishers come from the firmly fundamentalist side of conservative evangelicalism. And each of them has produced textbooks that tell a very different story than the one you might find in a public-school textbook. A Beka, for example, explains the origins of humanity in the Americas as the direct result of the collapse of the Tower of Babel. When that happened, people were pushed all over the earth, including into the Americas. And the BJU Press textbook asks review questions you would never find in any public-school history book: How does the early colonial history of the British teach lessons about the biblical morality of gay marriage in today’s world? What can Deuteronomy tell us about the Puritans? No one doubts that these textbooks tell a very different history from the ones you’d find in a public school. History, in these tellings, is the unfolding of God’s plan over time. Human activity is but a scrabbling, either towards or away from the divine. And the makers of these books have made no secret of their desire to replace mainstream historical thinking with conservative biblical interpretations. In other words, the entire point of these textbooks is to replace the histories kids might be hearing elsewhere with a profoundly biblical story. So does this count as the active construction of ignorance? Or is this, rather, simply a different version of what we usually call simply “education”? After all, kids come to public schools filled with historical knowledge, much of it bogus. Many of them get that knowledge from movies such as Forrest Gump. They think that history has been made up of Tom Hanks’ travels though time meeting famous people. Every good history teacher has to try to squeeze out those false historical notions and replace them with better ideas about history. Activists such as Jonny Scaramanga might blast fundamentalist textbooks as near-criminal impositions of ignorance on hapless kids. But these textbooks, we could argue, are doing the exact same thing as textbooks in public schools. They are trying to help children block out what they consider to be false knowledge with something they consider more true. Can we call that peddling ignorance? Even if we think the history is wrong? Or do we have to admit that all education consists of an attempt to push out some kinds of knowledge to replace them with better kinds? What is the role of the child in school? Many conservative thinkers, now and in the past, have insisted that children must learn to submit to teachers’ authority. Before they can learn to read or figure, children have to learn that obedience is their proper attitude. These days, this penchant for submissive children has leached out of the world of traditionalist thinking into the burgeoning world of charter schooling. A recent interview with a leading scholar highlights the ways conservative values have reasserted themselves as the mainstream norm. these schools have developed very elaborate behavioral regimes that they insist all children follow, starting in kindergarten. Submission, obedience, and self-control are very large values. They want kids to submit. You can’t really do this kind of instruction if you don’t have very submissive children who are capable of high levels of inhibition and do whatever they’re told. . . . They want these kids to understand that when authority speaks you have to follow because that’s basic to learning. Ask anyone familiar with urban charter-school education these days, and you’ll hear similar stories. For those of us trying to figure out what “conservatism” means in education, this leads us to some difficult questions: Did these goals and values move from fundamentalist and conservative activists into the mainstream? And if they did, how? In my historical research into the worlds of conservative educational activism, I’ve seen it time and again. For decades—generations, even—conservative thinkers have insisted that submission is the first lesson of successful schooling. Without submissive children, teachers will not be able to transmit information. Without the successful transmission of information from teacher to student—according to this conservative logic—education has not happened. Permissive discipline, for example, is wrapped up with teaching methods that always try to make learning into a game, a mere extension of play, the characteristic activity of the child. Progressive educators overlooked the fact that always making learning fun is not the same as making learning interesting. . . Memorizing and drilling phonetic rules or multiplication tables are ‘no fun’ (though the skillful teacher can make them interesting). They can have no place in a curriculum if the emotion of laughter must always be attached to each learning experience a la Sesame Street. the principal can know what is being taught. He can check the class and the curriculum to make certain that the job is getting done. Substitute teachers can also step in and continue without a loss of valuable teaching time. Some bloggers confirm that fundamentalist schooling has continued to emphasize obedience over intellectual curiosity. Jonny Scaramanga, Galactic Explorer, and Samantha Field have all shared their experiences with this sort of fundamentalist educational impulse. In their experiences, fundamentalist schools and homeschools have insisted on obedience, and have done so in a sinisterly gendered way. Young women and girls, especially, were taught to submit to male authority figures. Every student, however, seems to be pressed to submit and conform, not as a punishment, but rather as a foundation for education. To be fair, as I argued in an academic article a while back, there has been a lot of disagreement among fundamentalist Protestants about proper education. Just as the folks at A Beka were insisting that proper education began with submission, the equally fundamentalist thinkers at Bob Jones University pushed a very different vision of proper education. Led by long-serving dean Walter Fremont, the school of education at Bob Jones promoted a more child-centered sort of fundamentalist education. discipline, as well as the lack of fundamental knowledge teaching [sic], is one of the biggest lacks of the progressive school. Some parents shift the discipline to the school which is wrong, of course, but if the parents are at fault for lack of discipline, so are the schools. . . . Lack of consideration of others is the biggest fault of children today, and should not be too difficult to correct. Tantrums should never be tolerated, sassiness and disobedience should be controlled at an early age. School, you see, was not considered ‘fun’ in those days. It was a mighty serious business and was conducted that way. At any rate, once the two premises are accepted that (1) boys won’t behave in schools unless compelled to do so and (2) boys must be made to behave so that they can learn things that are essential for them to know, then the whole paraphernalia of corporal punishment falls into proper perspective. . . . Things have changed of late in the field of discipline, and more than somewhat. They started to change at home first, back in the twenties and thirties. The prime mover in their change was the new psychology, which was widely publicized and which caused parents seriously to doubt their proper role vis-à-vis their children for the first time in the recorded history of the human race. . . . The result was the emergence of the least-repressed and worst-behaved generation of youngsters the world had ever seen. As I researched my upcoming book about conservative activism in education, I found this theme repeated over and over. It goes something like this: Good schooling means the transmission of information to children. That transmission cannot occur unless children submit to teachers’ authority. Therefore, any meaningful education reform must begin with the establishment of an atmosphere of relentless obedience and submission. Professor Goodman doesn’t talk about “conservatism” or “fundamentalism” in the schools she visits. And many of the reformers these days who push for youthful obedience and teacher standardization would never call themselves conservatives, let alone fundamentalists. But it is difficult not to notice the overlap. Conservative notions of youth and education, it seems, have become the standard way to think about educational reform among groups such as Teach For America. First and foremost, in this understanding of education and youth, children must submit.